Casting a twinkly light, this easy-to-use fondue pot melts chocolate with a tea light, right in the pot. 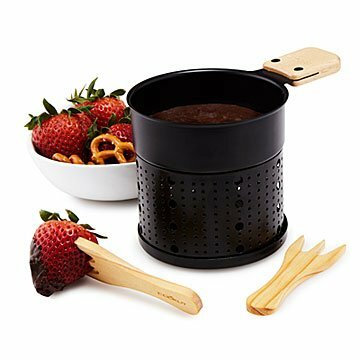 We are 1000% down with anything that makes chocolate fondue happen more frequently. By using a tea light as its heat source, this compact fondue pot not only casts some twinkly light on date night, but makes a romantic dessert for two or family fondue night easy and fun. Chocolate melts right in the pot—without scorching—in three to five minutes. Use the two adorable wooden forks, included, to spear and dip fruit, angel food cake, candy, or cookies, and dip them into the luscious, molten goodness. Bring it outside for picnics or back yard grilling. Choose either one pot for two people, or a set of two pots to serve a family of four. Tea lights not included. Made in China.